What is a Neoprene Squeegee? Neoprene is a type of rubber that is synthetically produced. It is commonly used in an industrial floor squeegee. It is chemical and abrasion resistant, stretchable, buoyant and waterproof. It is most commonly used in wet suits and protective gloves. Since it does not react with most of the oils and chemicals, it is perfect for industrial and commercial uses. A squeegee is cleaning device that uses a rubber blade to clear water or any liquid off a surface. In neoprene squeegees the rubber blade is made of neoprene. Industrial floor squeegees made of neoprene are the perfect janitorial cleaning product. Why are Neoprene Squeegees Best for Industrial Use? In industries there is use of numerous different oils and chemicals. These oils and chemicals are mostly highly reactive and not everything can be used in combination with them. According to standards governing different industries, cleanliness is very important to maintain. It is most important to prevent any environmental or health hazards from taking place. That is why neoprene industrial floor squeegee is the top choice amongst janitorial products for all types of industries. So whether it is a pharmaceutical or a food procession company, they can all use these neoprene squeegees. These squeegees come in a number of options that make them perfect for industrial use. These squeegees are available with curved or straight rubber blades and with or multiple edged rubber blades. The cured blade is best used in places where more liquid has to be wiped away. They also come in a variety of sizes starting from the smallest 14 inch rubber blade to the 54 inch one. The rubber blade is made from strong and durable neoprene rubber. The handle of the squeegees is made 14 gauge steel powder coated to prevent it from rusting or corroding due to contact with water, oil or chemicals. Neoprene rubber blade is resistant to oil, petroleum, grease, water and most common chemicals. Multi-edge floor squeegees are available for the cleaning of uneven surfaces. Neoprene floor squeegees are the cheapest cleaning product that you can find. The widest squeegee will cost no more that $80. Floor squeegees give the cleanest and driest results after cleaning. 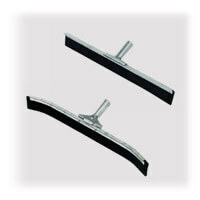 Industrial floor squeegees are mainly used for the purpose of cleaning spaces. It could be the production plant's floor or the inside offices, squeegees are the janitor's best friend. Mostly while cleaning outside spaces or areas like production plants where they may be some tough chemicals or grime to clean they can be used with power washers. As the power washer is used to clean away the dirt and grime using chemicals or water, the floor squeegee can be used side by side to wipe the residue away. A clean floor will be revealed. The choice of pressure washer depends on your boat size. Advantages of using power washers and surface cleaners.